As BlackBerry prepares to have the Amazon appstore preinstalled on their phones, I have already had my apps in the Amazon store for two years now. First of all the best place to have your apps is in BlackBerry AppWorld. If you are writing a native Cascades app, there is no choice except to sell your apps through the BlackBerry store. If you are selling an app based on a cross platform framework such as Cordova or Unity you are better off compiling that code natively to a .bar file as it will run much better then packaging the same code as an Android app. If you have a native Android app, then you are still better off compiling to a .bar file and submitting the app to BlackBerry World. Taking this extra step makes the app easier for users to update and also gives developers the possibility of removing the back bar from apps. However, simply having the ability to sell to Amazon’s own tablets and phones is enough reason reason to submit your apps into the store. For the most part the Amazon store is pretty similar to what all other platforms offer with developers getting a 70% cut of all sales. Payments are made out to developers via direct deposit to a bank account. All apps are submitted as .apk files and like Android apps on BlackBerry, they must not be dependent upon any Google Play services. 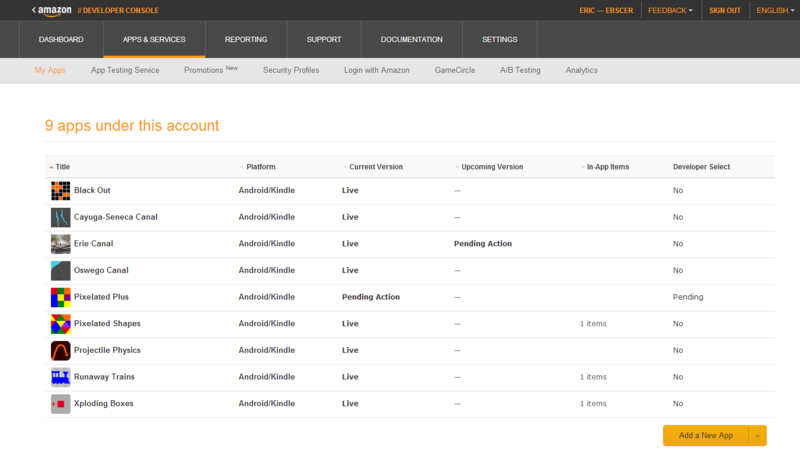 All apps submitted to the Amazon Appstore require a minimum of three screenshots (at one of a few specific resolutions), and are subjected to a rather comprehensive review policy. App reviews typically take around five days, with rejections usually a case of including a reference to the Google Play store (including something as simple as a link to your other Android apps).